Is there anything more valuable than you coming home to your sweet cats? Those cat babies give you so much love, joy, and comfort. You probably use every free moment to play with your cats and take care of them. With the taste of the wild cat food review, you know why the taste of the wild is a good food for your cat. Speaking of care, you possibly know the importance of buying good quality cat food. Just like humans, pets also need to eat appropriate food that contains the right ingredients. However, choosing good quality cat food is far more complicated than it seems. This is due to a variety of cat foods manufacturers that deliver cat food with different ingredients and level of protein, fat, and carbs. If your cat gets more fat and carbs that they need and eats low-quality food that will eventually cause serious health problems (such as obesity, kidney disease, and dental). Of course, not everyone can afford premium cat food, but there is still possible to find good options at reasonable price. One of those “good options” is certainly Taste of the Wild Cat Food. Packed with good quality ingredients that give your cat essential sources of protein, fat, carbs, and vitamins, and grain-free, this food is good-value-for-the-money. No doubt that your cat will love it. Without further ado, dive into our Taste of the wild cat food reviews. If you want to find out how these tests are taken, just click here. Now, let’s talk about Taste of the Wild Cat Food. The interesting title stands there with good reason. According to modern science, domestic dog and cats don’t have the DNA that is completely different from their ancestors. So, cats and dogs should eat food that tastes like the one they would eat in the wild. Of course, this doesn't mean that your domestic pets should hunt and eat their prey. This simply means that there are dog and cat food that provide your pet with the nutrition they need most, while also delivering flavorful taste. And this is exactly what Taste of the Wild Cat Food does – makes your pet happy and healthy. Don’t worry, later on; you’ll see a detailed list of Taste of the Wild cat food ingredients. 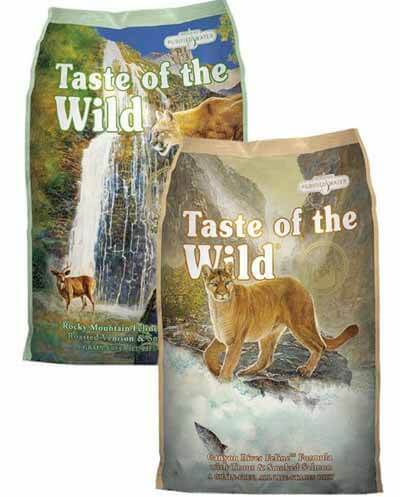 Taste of the Wild Cat Food comes both in wet and dry food, giving options to pet parents. This company makes food for dogs and cats, but in this article, we will focus on cat food only. Besides being clear of harmful ingredients that we mentioned above, Taste of the Wild Cat Food contains probiotics. But what makes this food a good choice for cats is a plethora of nutrients and vitamins that will give allow your cat to live a life full of joy and health. The ingredient should enhance their immune system, health, energy level, and make them happy. Probiotics are live bacteria that are good for your pet’s health. Your pet needs to have a healthy digestive system to be healthy. Taste of the Wild dry feline products contain Viables Probiotics while Taste of the Wild dry canine formula is improved with K9 Strain Probiotics. As we mentioned, the company is committed to bringing high-quality ingredients to your pet. That’s why the cultures are added to Taste of the Wild formulas only after the cooking process is finished. That way, the food will ensure active cultures that contribute to keeping your pet’s digestion healthy. Every pound of Taste of the Wild ensures 80,000,000 colony forming units of live and active cultures. Furthermore, Viables Probiotics and K9 Strain Probiotics are free of contaminants and harmful pathogens because they are processed in compliance with quality and safety standards. Grain-free food is free of wheat, rice, and corn gluten meal. If your cat has a grain allergy, then she/he will fall in love with this food. However, this feature isn't so impressive because most cats don't need a grain free diet. And compared to what most pet parents think, corn isn’t what causes most allergies in cats. According to one study that was published in Veterinary Dermatology, corn was discovered as one of the least possible sources of food allergy. On the other hand, dairy, beef, and fish were found to be primary sources of food allergies (45 cats out of 56 cats suffered from these allergies). Roasted venison, chicken meal, smoked salmon and ocean fish meal are a mix full of protein. This product contains 42% protein which is the perfect foundation for the strong and healthy body. Even though these ingredients are advertised on the food package, they actually aren’t the main ingredients. Quite the opposite, Chicken meal is the crucial ingredient. Now, don’t think that this is bad for your cat – there’s nothing wrong with Chicken meal. It’s just that Salmon and Venison draw more attention which means that customers are more likely to buy that. So, this is more like a marketing trick. However, these ingredients indeed offer a unique flavor that pets love. Plus they contain highly digestible protein. Considered one of greatest sources of carbs in pet foods, sweet potato is an excellent choice to bind the grain-free products. Peas are a great source of protein. But, the problem is that this kind of protein isn't very useful for your cat, simply because she/he cannot digest it. These ingredients are also present in Rocky Mountain Feline Formula. But, we aren’t fans of them, since they are used as an alternative to meat. Obviously, these vegetable ingredients are much cheaper than meat. And as far as we remember, vegetables aren’t a real feline diet. Chicken fat is a good source of fats. They are responsible for providing your cat with the energy so that he/she can live every day to the fullest. This is prebiotic fiber that also supports healthy digestion system. Thanks to Omega-3 fatty acids and Omega-6, your lovely pet will have healthy skin and a gleaming coat. Helps in protecting cells as well as enhancing the immune system. Calcium can be found in chicken and fish meal. It ensures your pet has strong bones and healthy teeth. Also, calcium keeps muscles in excellent condition. They are good for improving the overall health of your pet since they support ideal cellular health. They are found in fruits and veggies. This is one of the essential amino acids that every cat needs to have healthy eyes and heart. Both of these are available in wet and dry versions. What we really love about these foods is that they are created with cats of all stages in life. Therefore, if you have a kitten, you’ll be happy to hear that this food also works as Taste of the Wild kitten food. Even though some pet owners were skeptical about the food quality (due to many recalls of the company), those who decided to buy Taste of the Wild Cat Food actually loved it. 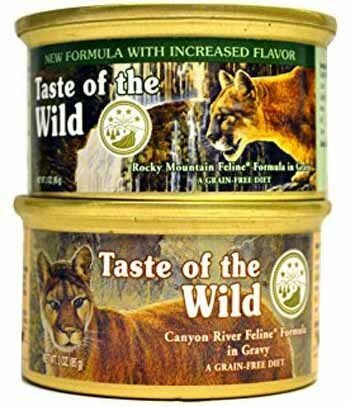 According to Taste of the Wild canyon river cat food reviews, cats love this food. However, keep in mind that there were a couple of negative. They claiming that the owner’s pets didn't like the ToW food. As it turned out, this happened because switching to the new food was too fast. So, before you decide to give your ToW cat food, make sure to do that gradually. Here you can find out more about transitioning foods. On the bright side, the vast majority of customers like these products, because they are high in nutrients, proteins and are easy to digest. Also, the price is reasonable (compared to similar cat foods on the market). Sweet potatoes, smoked salmon, roasted venison, vegetables, fruits, peas, and antioxidants. The food is grain free. Sweet potatoes, vegetables, fruits, trout and wood-smoked salmon and antioxidants. The food is grain free. Chicken liver, Salmon, and roasted venison, peas, antioxidants. Vegetables, antioxidants, Trout and salmon, fruits, sweet potatoes. It’s not rare that pet food manufacturer withdraws certain food products, due to numerous reasons. That being said, Diamond has also had product recalls, mostly because of aflatoxins and Salmonella. Moreover, some pet parents even went that far that they brought court cases against this company. 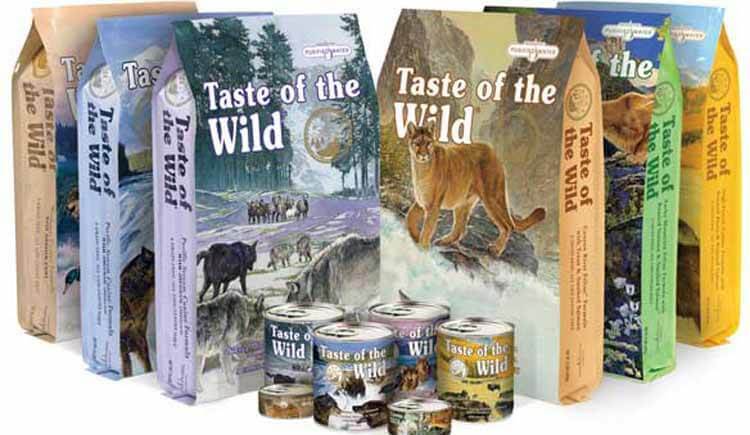 The good thing is that Taste of the Wild Cat Food was only once recalled, and that was back in 2012. Apparently, this year wasn’t very successful for the company, since they recalled 9 brands. In spite of these setbacks, this company managed to hold up. After these Taste of the Wild cat food reviews, the company gave their best and found out what were their mistakes. Hence, they greatly improved the products, offering much better quality ingredients and safety so that pets can enjoy the food. As already mentioned, pet foods have to pass various tests before they would leave the company’s facilities. What also contributes to the safety of their products is that the formulas are made grain-free and without artificial flavors, colors, and preservatives. Besides, their products are free of ethoxyquin and aren’t irradiated. Well, that would be it, folks. We hope this Taste of the Wild cat food review brought you new insights so that you can treat your little cat with the food he/she deserves. Dry food offers more benefits to your cat than canned food, but if you feed your cat properly and make sure that diet is balanced, their health will be at an optimal level. As for the products that we mentioned in this article, they are by no means perfect. However, they do have many h﻿ealth benefit﻿s and taste grea﻿﻿t so your cat will definitely have a good use of any of those products, especially Rocky Mountain Feline Formula.